The Texas Association of Professional Process Servers made its public debut at the 2017 NAPPS Conference in New Orleans, LA. Though there were many questions of WHY the great State of Texas has a new organization for professional process servers, we received overwhelming respect for sticking to our guns and making sure that certified process servers received the representation they deserved in the 85th Texas Legislative Session. TxAPPS President, Travis Wyatt; Vice President, Jessica D. Jester Saucedo; and Director, Scott Thomas, along with several members who were at the time, pending membership approval, were in attendance in New Orleans. All of us were excited and a little nervous to be making our official introduction to NAPPS, as we’d only held our first meeting on 4/20/2017. Scott Thomas serves as the NAPPS Photographer each year at the NAPPS Conference. In between fending off the alligators and playing his game, he utilized his time on the golf course during the Alan H. Crowe Memorial Golf Tournament to break the ice and make the initial introduction of TxAPPS, which paved the way for the rest of us to invite many NAPPS members to join and support our efforts. 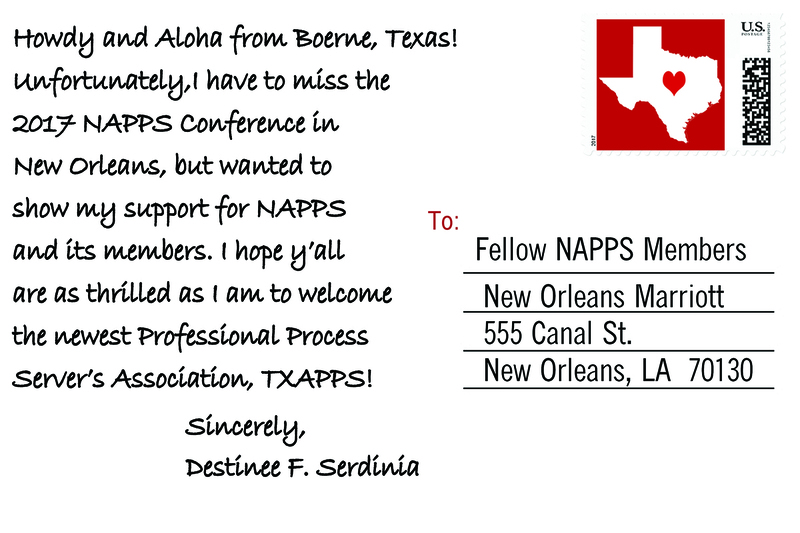 Though NAPPS member, Destinee Serdinia’s TxAPPS Application was not yet fully approved and she was not able to attend the conference personally, Destinee was so excited to have the opportunity to introduce TxAPPS at the NAPPS Conference, she printed up and provided a post card hand-out in each of the NAPPS give-away bags. Yet another great way to break the ice and quietly introduce the newest Texas Association on the national level. Over-all TxAPPS was well received. We took a handful of applications for membership and have already received a couple of Associate Member applicants, as well as our very FIRST Sustaining Membership application, for which we were very excited about; as the partnering and sustaining level of membership are new and we need to those members to help fully perfect the benefits those members receive from joining our organization. 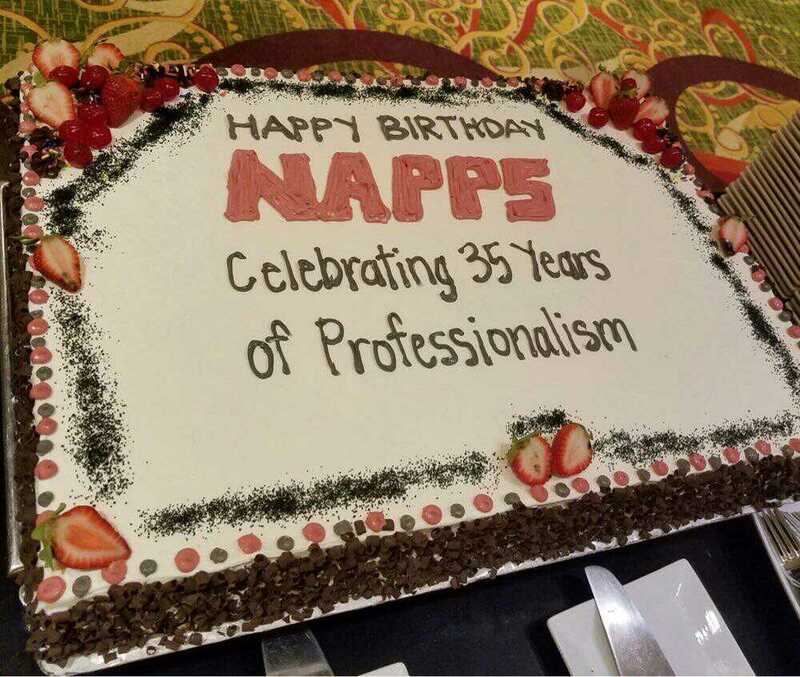 2017 was the 35th Anniversary of NAPPS, which was celebrated with a birthday party on Thursday, 5/18/2017. New Orleans is just a great place to celebrate a birthday, there’s so much to do! Canal Street, where the venue hotel was located, literally shuts down lanes nightly for a parade! We saw floats and live bands and people dressed the part of Mardi Gras, even though it was May. NAPPS members had a great time with the WHOVA app (https://whova.com/), a mobile app for those techy folks who like to follow the event’s agenda online. The app sends message notifications when specific events from the agenda you want to attend are about to start, to keep all attendees updated on the actual schedule; not just the printed version. Member Benefits Chairperson and NAPPS First VP, Jillina Kwiatkowski, did an excellent job of promoting use of the app by promoting a best photo contest and a best photo caption contest via the Whova app. Over 125 photos were taken and added into the app and winners, who received gift card prizes, were announced at the Saturday Night Banquet. 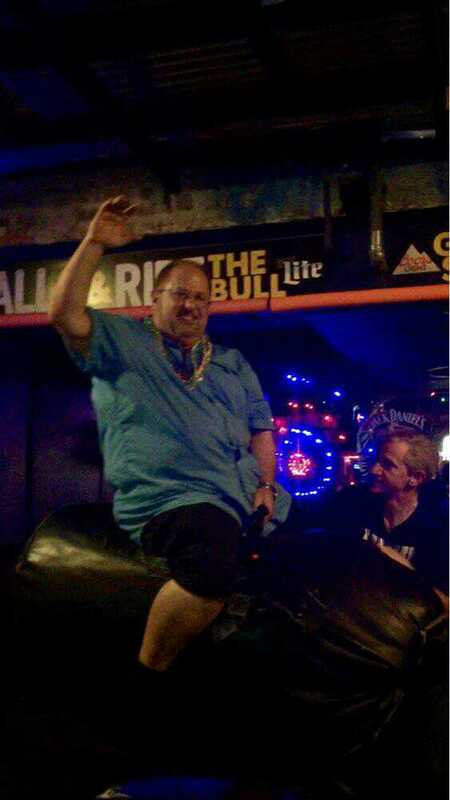 Texas’ own, “Blu” Daniels won the photo caption contest with a standard Texas saying “Hold my beer and watch this!” as a caption for this photo (right) of Cliff Jacobs, CalsPro Immediate Past President, First Legal Support, Fairfield, CA. 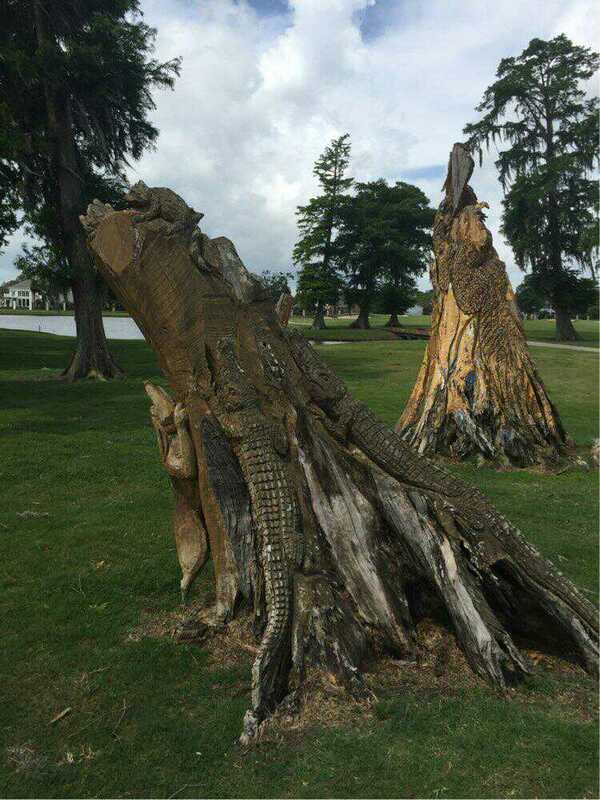 submitted to the Whova APP by NAPPS member, Melody Bulso, ProVest, Tampa, Fl. NAPPS has been utilizing the Whova APP during the Conference for a couple years now, but the photo contests this year really got people interested in using the app. During the NAPPS Annual Members Meeting, there was a call out for more support from State Associations to work more closely with NAPPS Legislative and State Association Committees so that NAPPS can keep members across the world up-to-date on everything happening at a local level. With the help of our members, TxAPPS would like to answer that call and keep NAPPS on our regular mailing list so that they receive notifications, newsletters, and other updates on things happening around our State. NAPPS has been doing a great job promoting process servers nationally and even globally. Several international NAPPS members were in attendance at the 2017 Conference, including Jacques Gielen, all the way from Brussels, Belgium. 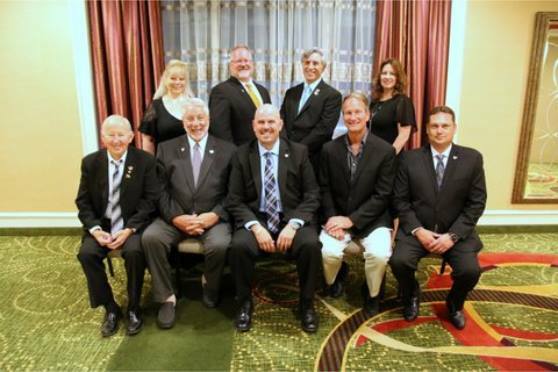 This year, NAPPS recognized one of its very special supporters, LaFourche Parish Sheriff Craig Webre, who spoke before the members on Friday during the Membership Meeting. Sheriff Webre has been a great ally to process servers as past President of the National Sheriff’s Association and was presented the Donald C. “Mac” MacDonald Award for Professionalism & Distinguished Service this year. Sheriff Webre sent Deputy Chris Egan to present an educational seminar “Safety in the Field and Personal Awareness”, on Saturday May 20. Mr. Egan’s contribution to the Conference was one of the most informative and well attended educational sessions NAPPS has provided in years. Deputy Egan’s experience, advise, and general discussion was enjoyed throughout the afternoon and into the evening. Our Texas hat’s off to NAPPS and the the LaFourche Parish Sheriff’s Department for their great presentations! TxAPPS also would like to Congratulate the newly elected NAPPS Officers and Directors! 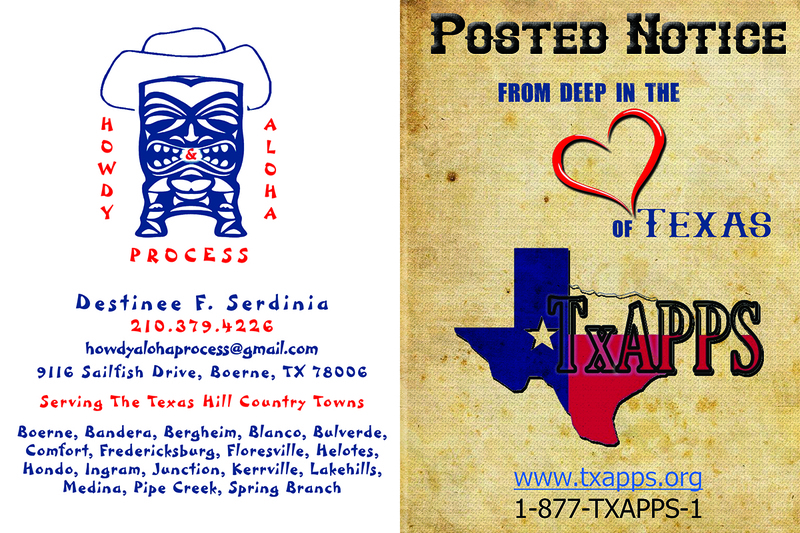 TxAPPS plans to be there, how about you?